On March 13, 2015, a sold out crowd at Port City Music Hall eagerly anticipated the arrival of one of the state’s proud musical products. No, not Lenny Breau (RIP, by the way), but rather a compact dynamo of an individual that goes by the name of Lady Lamb (née Lady Lamb the Beekeeper, née née Aly Spaltro). This would be my first experience seeing an artist in a live setting that has done the unthinkable: made it out of the state of Maine and come back, not with tail between their legs, but firmly established with many outposts throughout the country as well as parts of others. There was certainly a different feeling in the air, a feeling that this would not just be a routine concert, but a celebration, a homecoming. The first act of the night was Henry Jamison, a musician who had spent some time in the Portland area as the leader of The Milkman’s Union, but now resides in Vermont. Jamison had command of his voice – a mellow, yet haunting sound that felt very much at home nestled in reverb. The occasional appearance of an upright bass, especially when bowed, added to the melancholy of the sound, but also added a roundness and directness that the solo acoustic songs did not, or weren’t meant to, have in the first place. If Henry Jamison’s set left all at the show in a contemplative state of mind, it was quickly whisked away by the eclectic sounds of Brooklyn’s Cuddle Magic. I know it’s an overused word, but how can a band not be eclectic when they have a vibraphone, clarinet, trumpet, and double bass at their disposal? I’m still trying to make sense of Cuddle Magic, which may be missing the point. They seem to pride themselves on their ability to be musical chameleons. No two songs were ever alike, but there were common elements that held them together, namely their tight vocal harmonies, stomping beats, and emphasis on returning melodic motifs. Cuddle Magic is a band that leans heavily in synthesizing sounds, and I strongly detected elements of hip hop, jazz, folk, and a splash of ELO for good measure (And yes, I desperately wanted to namedrop ELO in this review). For some reason I even heard Evanescence and Tower of Power also, but I had a fever that night and I’m pretty sure I saw a kangaroo in a business suit as well (or was it Jonathan Lethem?). As strong and distinct as the first two acts were, it was clear who the audience came to see. The moment Lady Lamb took the stage, a buzz in the crowd began. It was an appreciation for someone who was one of their own and had come back to give thanks. The set began with a burst of energy that didn’t let up. I was initially reminded of PJ Harvey as Lady Lamb and her homegrown band (Derek Gierhan on drums, TJ Metcalfe on bass) ripped through some heavy tracks featured on her newest album (After released on Mom + Pop Music), but the band still had a feel that was all their own. Within the hard driving songs that oscillated between muddy, Neil Young power chords and Eastern-tinged grooves, Spaltro’s voice was always front and center: a blend of self-possession and vulnerability. 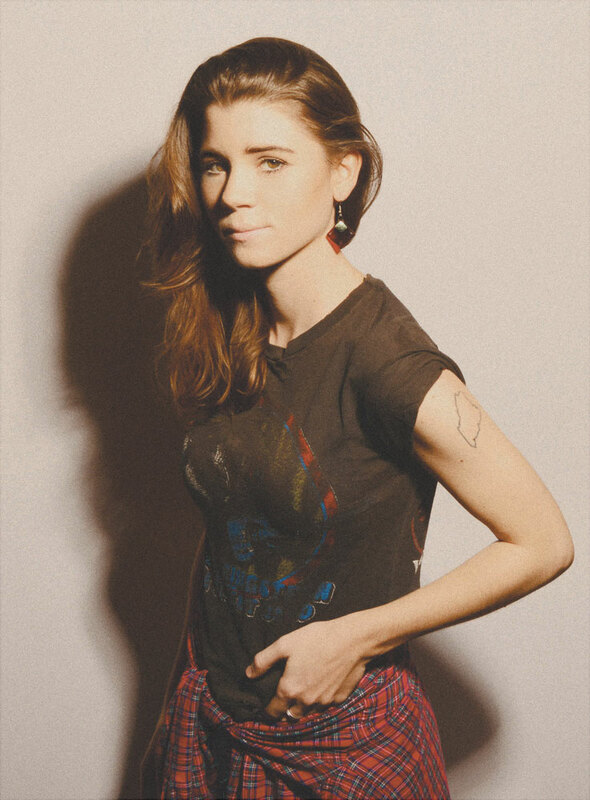 In the middle of the set, Lady Lamb settled into a more intimate grouping of songs, many of which premiered during Spaltro’s earlier years in Portland. The energy ramped up once more as the band returned to full rock mode for the remainder of their time on stage. Without a doubt this was a special show for the artist. She went out of her way several times to express her gratitude to those who have always supported her and her love for a state that runs deep enough to be branded on her left arm. There was even a point where she gave a shoutout to her cousin in the audience whose shirt she was wearing. If only every show could be this celebratory. A friend and I discussed what makes a truly worthwhile live musical experience. So many times we have been to shows where you were watching what amounted to animatronic musicians projecting pre-recorded music. It would have been easier to just stay home and listen to the records (and the drinks would have been much cheaper, too. Ever tried Schaefer’s?). Sometimes a band will mask (pun) the fact that they’re phoning it in musically by distracting the audience with dazzling pyro and slumping bodies hidden away in jumpsuits (Kiss obviously being the most successful practitioners in that field). But what makes a truly worthwhile musical experience, if we are trying following the “record-to-live” criteria, is how a band can capture the feel of what makes them unique on the record while still providing fresh insights into their talent that can only be experienced when occupying the same space. Going to see Odesza at Port City gave me this type of experience. I must confess that I know next to nothing about electronic music/electro-pop. My knowledge starts and ends with Brian Eno (does he count? Illuminate me, hepcats). But I was really impressed with Odeszas’s 2014 record In Return. What was interesting about the album was their ability to mix groove, ambience, and melody, their blending of the anxious and the ethereal together in a way that worked most successfully by taking the album as a whole. I wasn’t sure what to expect when I went to see them. I don’t know what the hell DJ’s do on stage, and I probably never will. I assumed they would hit a couple of buttons on their mixers and let the album play in its entirety while they sat in chairs and read the funny pages. Meanwhile scores of fans rolling on ecstasy would begin grooving with their eyes closed, their heads filled with kitty cats, puppy dogs, and rhombi (I had this alllll figured out). There were still traces of the melodic element that featured so prevalently on the album (the prevalence on In Return was due to the use of several guest vocalists, none of whom could corporally be at the show). But the aggressiveness was provided by a much more pronounced emphasis on groove, especially from the bass that had been cranked up well past polite levels. It was definitely worth the money (Note: I got free tickets) to see the Seattle duo live and experience their ferocious side, as opposed to my more contemplative experience with In Return. Has this helped me have a better appreciation for electronic music? Yes. Will I continue to follow the career of Odesza? Yes. Will I be allowed to write another review? I don’t know.